You know what you need to do—provide personalized service anytime, anywhere, on any device. You know why you need to do it—a 10 percent increase in your customer experience score can translate into an additional $1B in revenue! 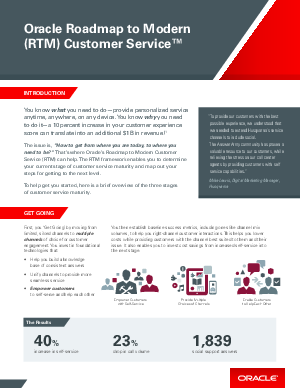 The issue is, “How to get from where you are today, to where you need to be?” That’s where Oracle’s Roadmap to Modern Customer Service (RTM) can help. The RTM framework enables you to determine your current stage of customer service maturity and map out your steps for getting to the next level. To help get you started, here is a brief overview of the three stages of customer service maturity.